Dunlavin Strings: this is a violin programme based after school in Dunlavin and is supported both by Scoil Nicholas Naofa and the parents of attending students. This programme is open to all children and currently has 15 students. Our emphasis is on learning to be a proficient and skilful player and also participating in our ensemble classes which run as part of our programme. 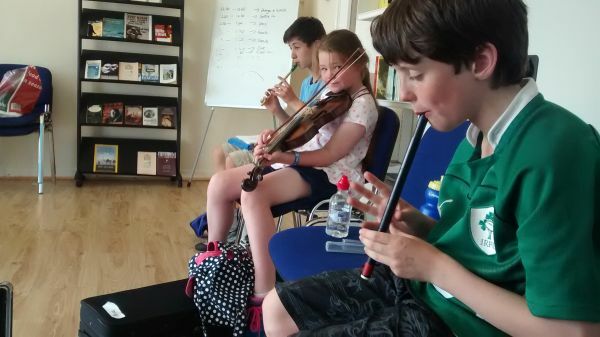 Blessington Music Hub: Blessington Music Hub opened its doors in early 2015 and is based in the Further Education Centre on Friday nights. This Hub was created as a community resource and currently provides tuition for young people in guitar, bass, keyboard in small groups and has three traditional music groups also in attendance. There is a fully equipped rehearsal room for young musicians to book, rehearse and record their music. We have several musicians/tutors on hand on Friday nights to teach, guide and encourage all kinds of music making and collaboration. Composers Club: Coláiste Chill Mhantáin after school. This programme gathers together musicians and composers from the school and mentors the group in the creation of new music and playing together. Samba Drumming – St. Peter’s Primary School after school. The drumming sessions are open to children from any school to attend and run in block of 10 weeks.